This soft set, tawny coloured marmalade has a wonderful citrus flavour, delicately spiked with shreds of ginger. Cut the yellow peel from the white pith of the grapefruit and lemon. Cut the peel into fine shreds. Cut away as much white pith as possible from the grapefruit and lemon flesh. Finely chop the flesh, removing all the pips, and place in a large preserving pan. Tie the white pith and pips together in a piece of muslin and add to the preserving pan with the peel and water. Bring to the boil and simmer gently for 1¾ - 2 hours or until the peel is tender and the contents of the pan reduced by at least half. Remove the muslin bag from the pan, squeezing well and allowing any juices to run back into the pan. Add the sugar and finely shredded ginger and stir continuously until the sugar has dissolved completely. Boil rapidly for 10-15 minutes then remove from the heat and test for a set. It is ready when the temperature on a sugar thermometer reaches 105ºC. Alternatively spoon a tiny amount of marmalade onto a chilled plate then push it with your finger to see if it wrinkles. If it is not ready it should be returned to the boil for a few minutes and retested. Add a small knob of butter to the pan after the setting point has been reached to disperse any scum. 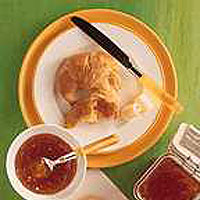 Allow the marmalade to stand for about 20 minutes to prevent the peel rising to the surface. Pot into sterilised jars and immediately cover with waxed discs and cellophane covers.